All Through the Night has several new things... 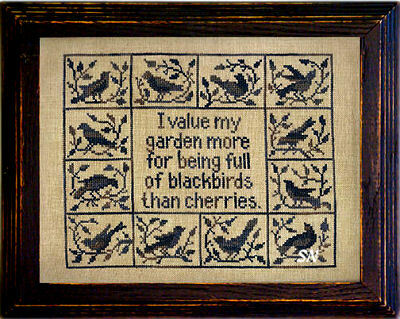 I chose 10 of them... simple and cute... all are offered as charts. 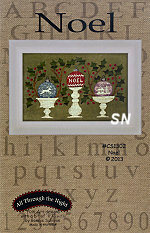 Sew Happy finishes 8 x 10 on 30ct Weeks Putty linen... he is worked in Gentle Art Sampler Threads. I think he'd make a cute doorknob hanging for your stitching room! If you aren't lucky enough to have a *Stitching Suite*... maybe you have a thread box that needs a stitched top? 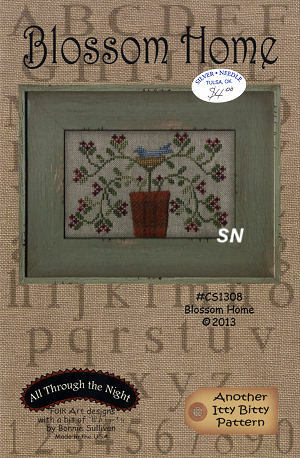 Oh, this one is pretty -- and can be stitched on anything in YOUR favorite color of thread! 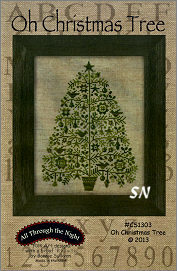 Choose one hand-dyed or make the tree and ornaments all the right colors - metallics, beads, little trinkets??? Whatever! Finishes 5-1/2 x 7 on 18/36ct. This little guy is back in stock after we lost track of him for several years! 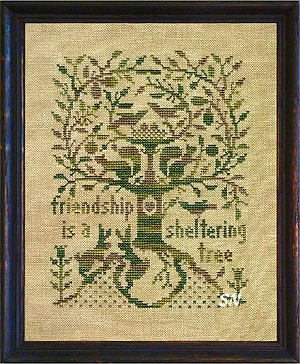 THE CUTEST thing, he is stitched on Weeks Dye Work's hand-dyed Onyx linen in shades of Gentle Art's hand-dyed cotton Sampler Threads. Finishing a generous 4-1/2 x 7 on 30ct, we've always loved the colors in this. 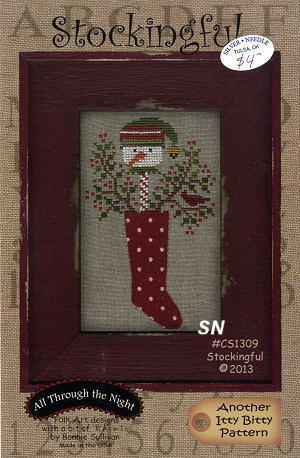 It's another pattern that could go two ways... do just the mitten, or just the snowman, greenery, star and flake! If the black is too dark for your eyes, consider one of the various deep gunmetal fabrics available now. 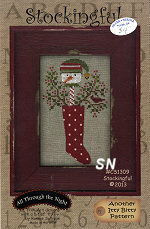 Lots of other cute designs by Bonnie Sullivan on our inside All Through The Night page! 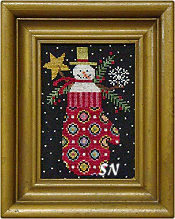 Christmas designs... Stocking is small -- only 45 x 48 stitches. 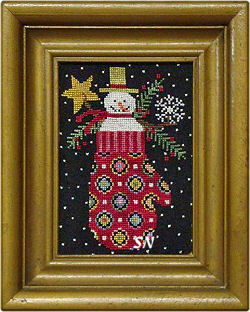 It features a cut of wool or fabric as the stocking! I could see a JABCO bell button on the end of the hat.. a carrot nose button, and red beads for all those berries! Cute! Noel is larger -- 101 x 162. Lots of Gentle Art flosses, I love the distressed dishes holding the ornaments -- but those glass balls would be neat presented by themselves, as well. A neat, unique design. All are offered as charts. 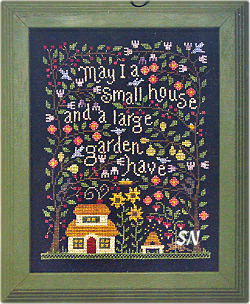 'May I a small house and a large garden have' is the verse on this charming, overgrown, turbo-lush garden-lover's piece! 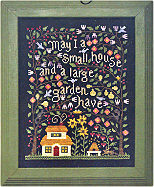 A secret wish of anyone with a green thumb! 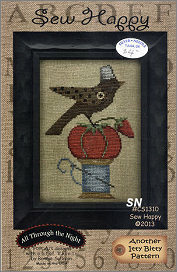 Stitched on Weeks 30ct Onyx linen in 16 shades of Gentle Art Sampler Threads, this uses only Cross Stitch, but you could always add some Rhodes or Eyelets in the flowers and some Satins on the beehive. 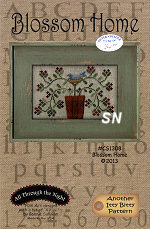 Such a pretty piece, finishing approx 7-1/2 x 9-1/2, very unique and eye-catching, it is offered as the chart. 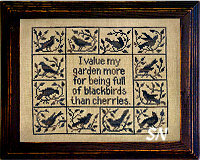 108 x 137 Stitch count... this is worked in one color of hand-dyed -- your choice! Pick a neat black to get some pretty variation. Finishes approx 7 x 9 on 30ct. Another pretty one, this finishes approx 6 x 7 on 30ct. Check out all the little things that are sheltered by that winding tree... the squirrels, birds, bunnies and flowers! 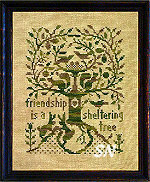 This is done in an overdyed olive green shade of your choice. We found a new designer to the cross-stitch industry at Market a couple of weeks ago -- All Through The Night. They've been in the quilting end of things, and have begun to chart some designs! 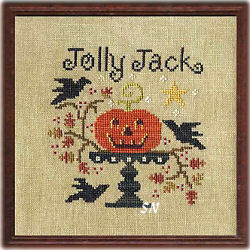 Their first, Jolly Jack, is offered as a 5 x 9 chart, with a beautiful glossy model pic,and he's awesome! Worked on Weeks 30ct Putty Hand-dyed linen, in 9 different shades of Weeks flosses, he finishes approx 5 x 5. 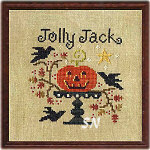 Jolly Jack is Cross Stitch... the rest are basic embroidery!